‘Flu’, or influenza to give its correct name, regularly occurs during the winter months and periodically there are pandemics. Caused by a virus, the usual symptoms are chills, fever, sore throat, severe muscle weakness and headache, coughing and sometimes vomiting, particularly in children. Infection is spread by coughs, sneezes and contact hence, the advice to wash hands frequently. During the 20th century, there were three major pandemics with the Spanish ‘Flu’ of 1918 the most lethal. World War I (1914-1918) claimed an estimated 16 million lives the ‘flu’ epidemic claimed somewhere between 50-100 million lives. The pandemic started in Spain and came in two waves. The symptoms in the first wave were, in practically all cases, the same at the outset – a sudden violent headache with renal pains and a rapid rise in temperature. The recommended treatment was quinine or salicylate of soda. 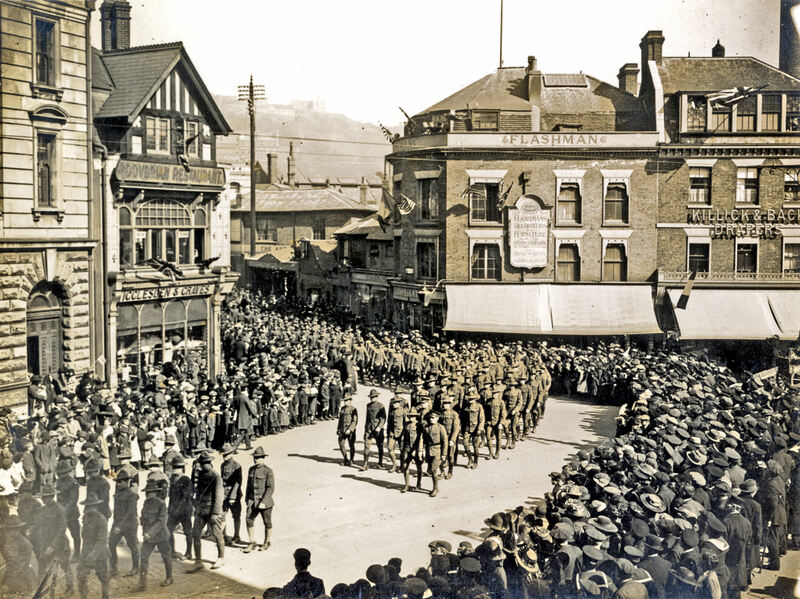 This phase reached Dover at the end of March 1918 and lasted until July. In accordance with the Local Government Board recommendation (a government department) a 3 member emergency committee was set up headed by the Dover temporary Medical Officer of Health, Dr MacDougall of Folkestone Road. The committee was based in the former stable block at Brook House now the Citizens Advice Bureau. 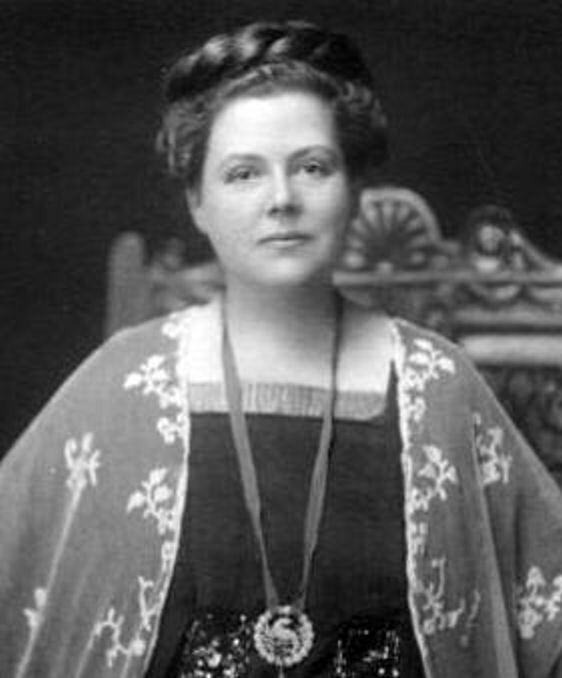 The committee had the full powers to act and incur expenditure and it included Lorna Bomford, Dover’s only female councillor and pre-World War I leader of Dover’s Womens’ Suffrage movement. The initial ‘flu’ epidemic ran its course and in May, when it appeared to come to an end, the emergency committee was disbanded. However, in October the second wave arrived and it was not only highly infectious it was so severe that fatality was frequently the outcome. The deaths were caused by heavy bleeding from the nose, stomach and intestines or through suffocation as the victim’s lungs filled with fluid. The cause was not identified, the infection difficult to control and even more difficult to treat. During the second week of October 1,895 deaths in the civilian population of England and Wales were reported and in the weeks that followed the number of fatalities increased. As the country was at war, Dover was under Military Rule with civilians represented by the elected council the head of which was Mayor Edwin Farley. A conscientious and liberal man, who cared deeply for town and its folk, reacted out of character to the epidemic when it hit the town the second time. The council agreed that they had over reacted earlier in the year as the first wave had been similar to winter flu of the previous ten years. These had caused, on average, 14 deaths a year. Therefore, it was agreed, that it was not the job of the council to be the town folks ‘nannies’. Dover’s Medical Office, Dr MacDougall, asked for the reconvening of the emergency committee but this was declined. To try and change the council’s mind was made more difficult for Dr MacDougall was on probation with the council. Following his protestations it was decided to make his position temporary until a new, more acquiescent, Medical Officer was appointed. As the town was under Military Rule, there was a large military presence and besides the military hospital on Western Heights, Castlemount at the top of Godwyne Road, had been commandeered as a military hospital. 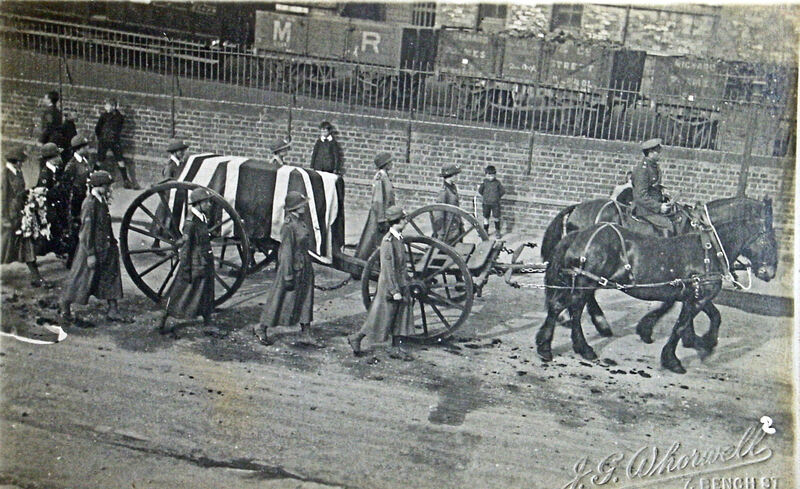 It was there that ‘flu’ stricken military personnel were taken and men were dying. In the Thames and Medway District, the military had made all places of public entertainment, buses, tramcars etc. out of bounds to troops. This was implemented in Dover but the general lack of responsibility of the council angered the Commanding officers. Out of pure frustration and not wishing to use their full military authority, the Commanding Officers marched all of the forces stationed in the town to a parade near the Seafront. Having invited all the Mayor and councillors, council officers, medical practitioners’ etc. to watch, the order was given for the officers and men to ‘gargle their throats and wash their nose with the antiseptic solution recommended by the Local Government Board in their circular!’ The officers and men, having this equipment with them, did as they were ordered and then they were marched back to their barracks. The gargle was made up of three small crystals of permanganate of potassium dissolved in a tumbler of water with a pinch of salt. A council meeting was convened to which Dr MacDougall reported that the virus was ‘virulent’ in the town and that in the previous week thirteen deaths caused by influenza had been reported. His report made the point that it was particularly prevalent in areas of poor housing and was scathing about recently constructed houses for the poor. These, he said, were ill built and damp. The doctor finished by asking for the emergency committee to be reconvened and having the same powers as they had originally been given. His recommendations were declined; instead it was agreed that cinemas were out of bounds for troops – the military authorities had already instigated that all public places as out of bounds – plus the printing of 2,000 leaflets detailing preventative measures. These included the importance of keeping warm and dry and that all civilian personnel were to ‘gargle their throats and wash their nose with the antiseptic solution every evening before retiring.’ By the end of October the ‘flu’ situation in the town was much worse and the council announced that schools, where attendance had fallen below 80%, were to be closed! It took a Directive from the Local Government Board to persuade the council to close all schools but the council said that this was to be lifted on 11 November and not reimposed. On that day Peace was declared and, to commemorate the end of World War I, there were Peace Parties and street celebrations. 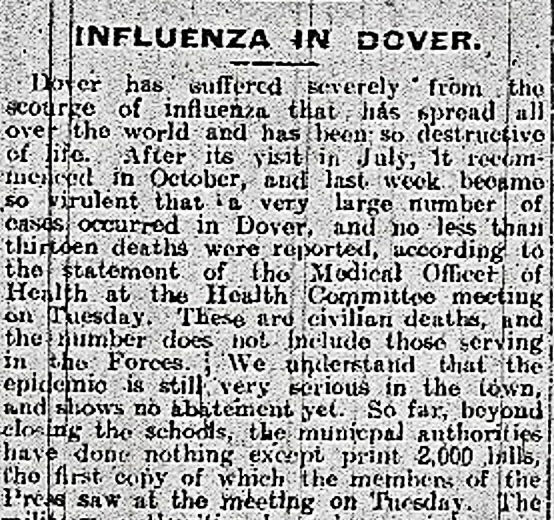 By the end of the month there were over 2,000 civilian cases of influenza reported in Dover, schools were closed and ordered to remain so until 11 December. The town’s medical, nursing and social care teams were stretched to the limit due to the epidemic so it decided that only those who could pay were to get help. In some poorer homes children were left with the responsibility of dealing with their dead parents bodies. On 26 December, Boxing Day, Susannah Bourne aged 17 of Military Hill, looking healthy and radiant, married Stoker Thomas Jones R.N. Susannah succumbed to ‘flu’ that night and was dead the following day. Criticism, already being heaped on the council, escalated with Susannah’s death. The council reacted by issuing an order to close cinemas but exempt other places of entertainment. It was not only Dover that was reluctant to close establishments catering for the public the attitude was prevalent elsewhere in the country. To counter this the Local Government Board issued all councils with statutory Regulations. These limited the duration of public entertainments to four consecutive hours and cinemas to two hours. 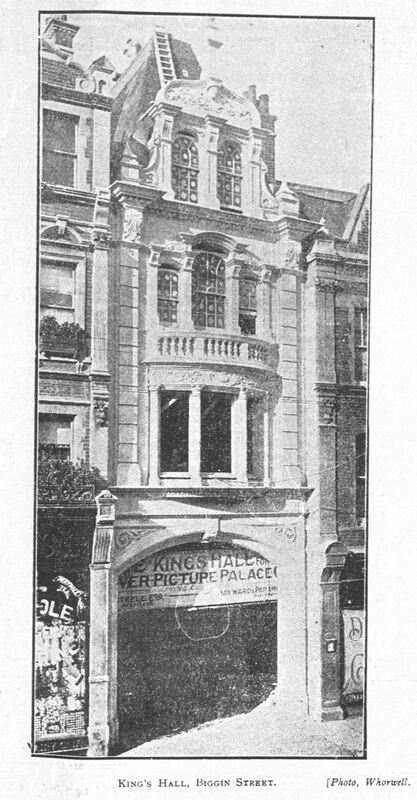 At places where there were two successive entertainments there was to be at least a 30-minute interval, during which the building was to be ventilated. In Dover, now taking the problem seriously, the council stated that the buildings were to be disinfected. The Directive banned children from elementary schools entering cinemas but one local proprietor refused to comply. 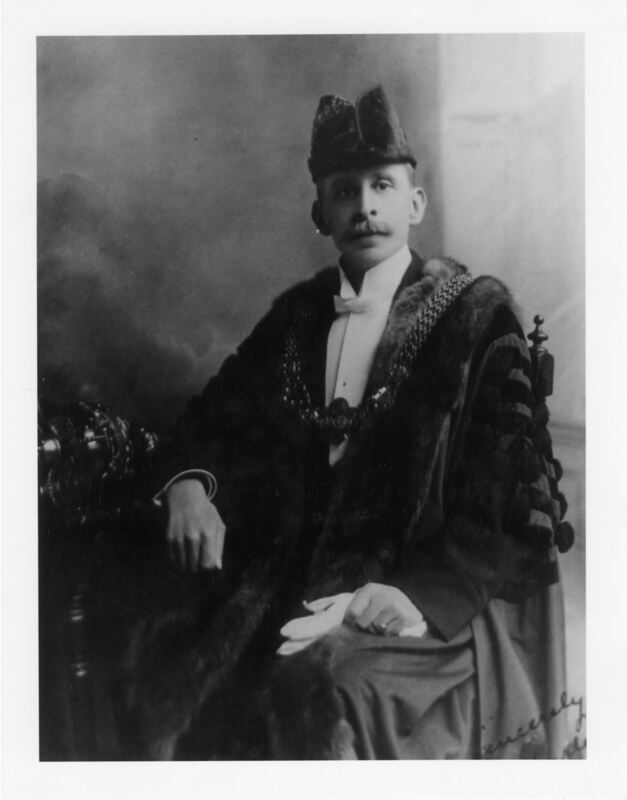 He was Harry Day, the owner of the King’s Hall in Biggin Street. When the council officer, backed by both a military and police presence, ordered children out of the cinema, Day threaten Dover Corporation with legal action. This he started but the council took out a High Court injunction and Day was forced to comply. By the end of that year, 90 civilians had died in the town. The military deaths were not included in the statistics. The lack of care for the poor was again something that was happening in other places besides Dover and this led, in January 1920, to the Ministry of Health issuing a directive recommending medical, nursing and social assistance for the poorer inhabitants of the country suffering from influenza. They also suggested the publication of information respecting all facilities provided. By this time Dr MacDougall had been replaced with Dr J Reginald Long, whose surgery was in Effingham Crescent, and as a local was expected not to be as demanding as his predecessor. Once Dr Long’s position was ratified as permanent he asked for an emergency committee to be set up with the special powers and the fait accompli was agreed! Alderman Sellen and Councillor Ord were appointed and given full powers. However, with regards to help to poorer members of the community who were suffering with influenza, this was deferred. In the council minutes it states that as there had only been three deaths from the disease that week only. Adding that six beds were reserved in the Isolation Hospital at Tower Hamlets for the reception of ‘selected‘ cases. Although the harbour was under Admiralty control and only used by authorised shipping, in February 1920 the council issued a directive that all persons embarking or disembarking would receive a copy of their emergency leaflet on influenza. This included members of all the naval establishments such as the Dover Patrol. By that time, Spanish ‘flu’ was on the wane but the following year, 1921, the number of people dying from influenza in Dover, was higher than the normal average and anti-influenza vaccine was issued to the doctors in the town. Medical researchers in Toronto, Canada had created a vaccine during the height of the 1918 epidemic that consisted of 18 strains of dead influenza germs. The following January (1922), the virus again returned to Dover and this time with a vengeance. Barton school reported 127 children and two women teachers sick. St Bartholomew’s had 46 cases, St James’ 25, Buckland school 21 cases, Charlton school 11 and River school 13 cases. All schools were closed between 16 January and 6 February except Pier Infants’, which had been closed for a measles outbreak on 9 January. The total number of deaths from ‘flu’ that month was 25, mainly children and young adults. The council followed the Ministry of Health’s advice closed Sunday Schools and all places children were likely to attend including cinemas and Harry Day complied! On a global scale, these ‘flu’ epidemics were not devastating as the 1918 Spanish ‘flu’ and were treated as normal influenza outbreaks and a local problem. The 1918 pandemic has been subject to many studies especially as 99% of pandemic influenza deaths occurred in people under 65 with more than half in adults aged 20 to 40 years old. Those who had succumbed to first wave and recovered were found to be less likely to succumb to the second wave or if they did, it was of a milder form, thus showing a relationship between the two waves. This entry was posted in Hospitals and Health, Local Government, Spanish 'Flu' - the epidemic that Dover swept under the proverbial carpet, Spanish 'Flu' - the epidemic that Dover swept under the proverbial carpet, Spanish 'Flu' - the epidemic that Dover swept under the proverbial carpet, World War I. Bookmark the permalink.